The earliest known balloon ascension to take place in the state of Massachusetts occurred on September 3, 1821, from the Washington Gardens on Treemont Street in Boston. 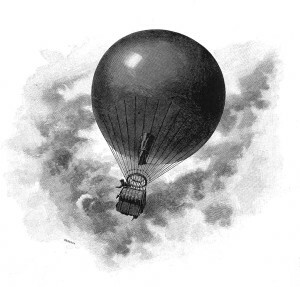 The pilot was a well known aeronaut by the name of Louis Charles Guille, who had begun making balloon ascensions in New Jersey in 1818. The balloon landed on Ten Hills Farm in Somerville, a town just to the north of Boston. Not only was this flight the first of its kind in the Bay State, but it also triggered what might be the first lawsuit involving a balloon. Ten Hills Farm was owned at the time by a man named Swan, who sued Aeronaut Guille for damage to his vegetable crops. The facts of the case were stated in a newspaper article which appeared in the New Ulm Review, (a Minnesota newspaper), on December 21, 1910, as part of an article about the potential liability attached to air travelers who may inadvertently cause damage to private property on the ground. The case involving Louis Charles Guille was cited as a president even though it had occurred 89 years earlier. ” The facts are there stated as follows: Guille ascended in a balloon in the vicinity of Swan’s garden and descended into his garden. When he descended, his body was hanging out of the car of the balloon in a very perilous situation, and he called to a person at work in Swan’s field to help him in a voice audible to the pursuing crowd. After the balloon descended it dragged along over potatoes and radishes about thirty feet, when Guille was taken out. The balloon was carried to a barn at the farther end of the premises. When the balloon descended more than 200 persons broke into Swan’s garden through the fences and came on his properties, beating down his vegtables and flowers. The damage done by Guille with his balloon was about $15, but the crowd did much more. The plaintiff’s damage in all amounted to $90. The sum of ninety-dollars was a significant amount of money in 1821. Guille appealed, but the decision was upheld. The court ruled in part that Guille was a trespasser, (although not intentionally), and that his shouts for help “induced the crowd to follow him”, which in turn made him liable. New York Tribune, “New Laws For Air Travel Soon To Be Broached”, October 24, 1909, page 3.